We often get people calling us to ask if we do custom mirrors. The simple answer is yes, we do. 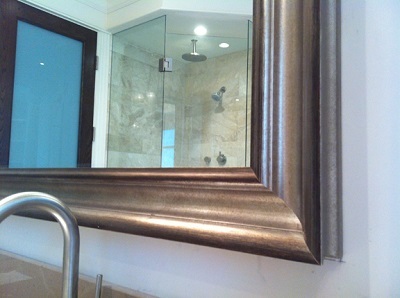 We make custom mirrors for our interior designer clients and regular retail clients, too. You can choose almost any frame sample we have in the shop –or something from any of our catalogues- and we can make it into a custom mirror. And we provide the glass, too. Mirrors come with a bevelled edge or without. Most people will provide us with what we call an outside measurement of how big they want their mirrors to be. The outside measurement is the total outside size of the frame –width and height. From there we can work backwards to figure out the size of the mirror we need to put inside it and go from there. 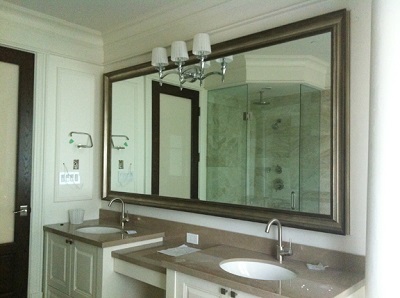 Our interior designer clients are often coming to us on behalf of one of their clients who want a custom mirror for their newly renovated bathroom. They need a frame that will match the fixtures or the cabinets or something like that. Other people come to us looking for something for a hallway or the dining room; something that can make a small space look bigger or something that will fit that certain spot between two doors or cover that electrical panel on the wall. We recently had a customer who asked us to make a door-sized mirror. She was selling her house and wanted to cover the pocket door to the furnace room in the basement. We fitted the mirror with a French cleat type of hanging system so that it could me taken down and replaced with minimal fuss. 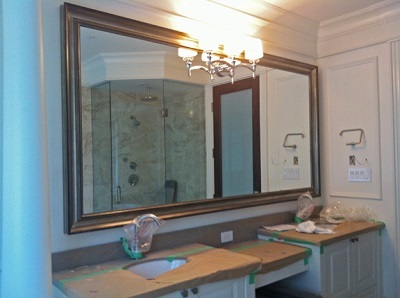 This a big mirror we made recently for a custom home built by VictorEric Design Group. There were two of these mirrors, each roughly 8-feet long by 4-feet high with a hole cut in each to accommodate a light fixture. We also made a third mirror, smaller and vertical for the main powder room on the ground floor.